Home » Picture sensation: Does viral image show crashed UFO on its way to mysterious Area 51? The photo (see below) was uploaded to social media by Charlene Yazzie. She passed the truck while driving on Arizona State Route 77 near Holbrook in Arizona. She was surprised when she noticed the truck was escorted by black Department of Public Safety (DPS) vehicles. She wondered what the covered flying saucer-shaped object could be and snapped a picture. She uploaded the picture to Facebook where it attracted a lot of attention. Members of the UFO community speculated freely about it. The response fuelled suspicion and sparked even wilder speculation, with conspiracy theorists construing it as an acknowledgment that the object was top secret and that the DPS personnel who escorted it had also been kept in the dark about what it was. UFO hunters alleged that the “higher ups” were hoping they could get away with transporting alien technology newly recovered from a crash site to Area 51 in broad daylight. UFO conspiracy theorists believe that the military and government agencies have recovered crashed UFOs from multiple sites in the past and that government scientists and engineers are working in multiple top-secret bases to reverse-engineer the propulsion technologies of the UFOs. According to conspiracy theorists, the first case known to the public occurred in 1947 when an alien UFO allegedly crashed at a ranch near Roswell in New Mexico. It was rumored that the military authorities recovered alien corpses from the crash site. Some conspiracy theorists claim that alien survivors in the crash were housed secretly in Area 51 and forced to help government scientists to reverse-engineer the spacecraft’s propulsion technology. Related conspiracy theories that emerged in the decades after the Roswell incident claim that the U.S. government entered into military-technology alliance with advanced alien races that helped the Nazis to develop the V-2 rocket technology. Major breakthroughs in the U.S. space program in the era after the Second World War were due to assistance received from advanced alien races, such as the Grays, the Tall Whites, and the highly evolved Arcturian races. Reports of ongoing advanced research into “impossible” EM Drive technology at NASA’s Eagleworks Laboratory and a new technology called “directed energy propulsion,” which could make a journey to Mars last only 30 minutes, have fuelled speculation that major breakthrough has been achieved in decades-long efforts to reverse-engineer UFOs recovered from UFO crash sites. According to conspiracy theorists, government agencies are deliberately teasing with snippets of information released to the media to prepare the public for the unveiling of new radical technologies derived from alien spacecraft reverse-engineering projects. 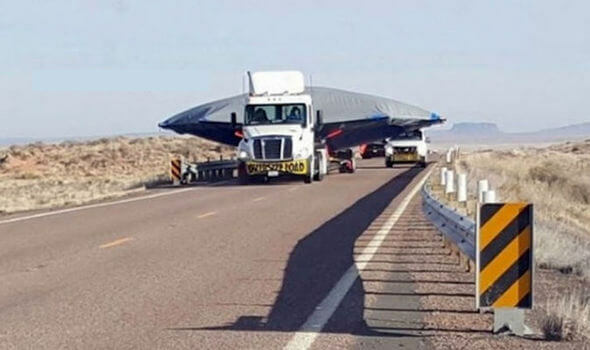 UFO blogger Scott C. Waring also asserted that the semi-hauler was carrying a flying saucer UFO, and that it was being transported from the top-secret Area 51 military base in the Nevada Desert. He suggested that the UFO could be the latest advanced technology from the U.S. government’s alien allies. “Ha ha! What is dumber than transporting a potentially earth shattering piece of secret equipment down a civilian roadway? Do it during the light of day! C’mon guys,” one skeptic wrote.